Did you know there's only six weeks until Christmas? Not to sound like an old cliche, but where has this year gone? How are we half-way through November? How is it 2018 in only SEVEN weeks? Terrifying. Despite my total horror at the ever-accelerating passage of time, I have (for once!) managed to start my Christmas shopping early this year, so I'm feeling pretty smug that my December can actually revolve around leisurely trips to the Christmas market for hot booze, rather than panicked scrolling through amazon. 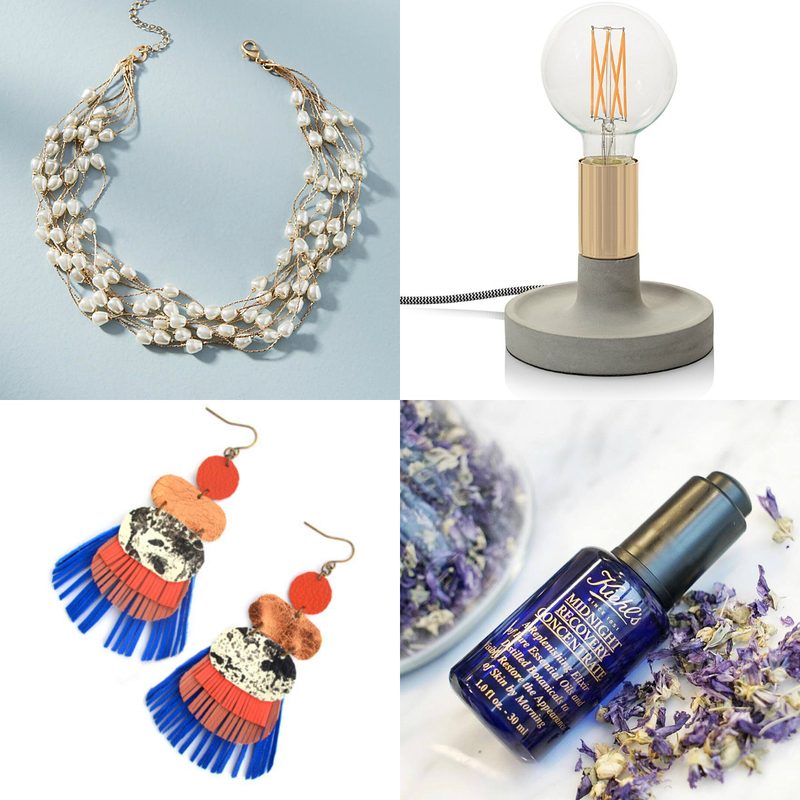 I've come across loads of lovely things on my search, so I thought I'd bring back the Ever So Juliet Christmas Guide, and point you in the direction of nice present ideas, with ideas that hopefully suit whatever budget you are on! 1. I am a sucker for a lovely mug, and these gilded monogramed mugs are particularly lovely (I also like pretty much everything in Anthropologie's monogram shop, if initials are your thing!). 2. Channel some Palm Springs vibes with this super cute mid-century house enamel pin. 3. I was given a One Line a Day memory book last Christmas, and it honestly has been such a great journal! You write a moment from each day for five years, and it's so nice being able to track the little moments, and thinking about what is yet to come! 4. I also have this and it's the greatest patch I own. Proclaim your love for Jeff loud and proud with this Jeff Goldblum Appreciation Society patch. 1. Got a slightly geeky pal to buy for? This etsy shop is packed with cute and quirky anime and video game-inspired accessories & art. These Night in the Wood earrings are adorable (the game is also adorable and you should definitely play it if you haven't already!). 2. This cactus ring dish is cute and practical (win win). 3. You'll never go wrong with gifting a candle! This soy candle is particularly nice. 4. How beautiful are these zodiac journals? They're super fancy and made with vegan leather too. cheese plant necklace is so much fun, and would be a pretty perfect gift for a plant lovin' pal. 2. How cute is this origami hippo lamp? You can get an elephant and rhino too, but obviously the hippo is the best one! 3. 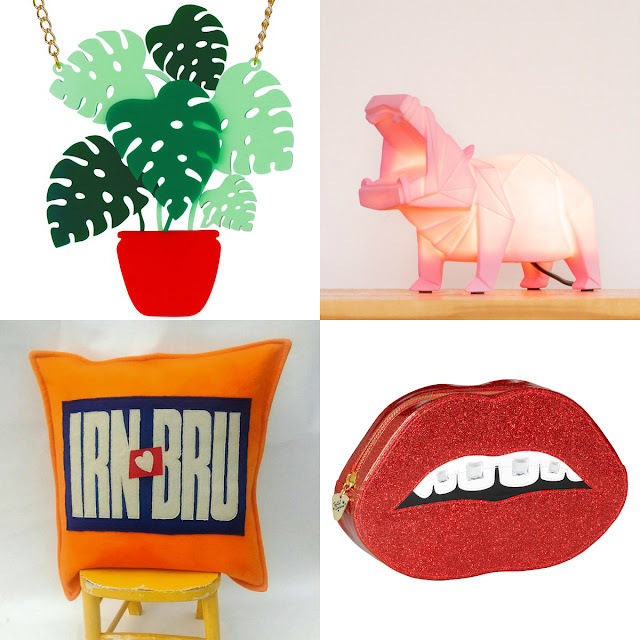 Get a Scottish pal something truly original, with this Irn Bru wool cushion made from a hand dyed vintage wool blanket. You can also get an Irn Bru bag to match! 4. Perfect as a seriously swish toiletries bag or a quirky clutch, Tatty Devine's dental bling bag is ace. 1. Everyone needs a good statement necklace, and this pearl necklace is very pretty. 2. 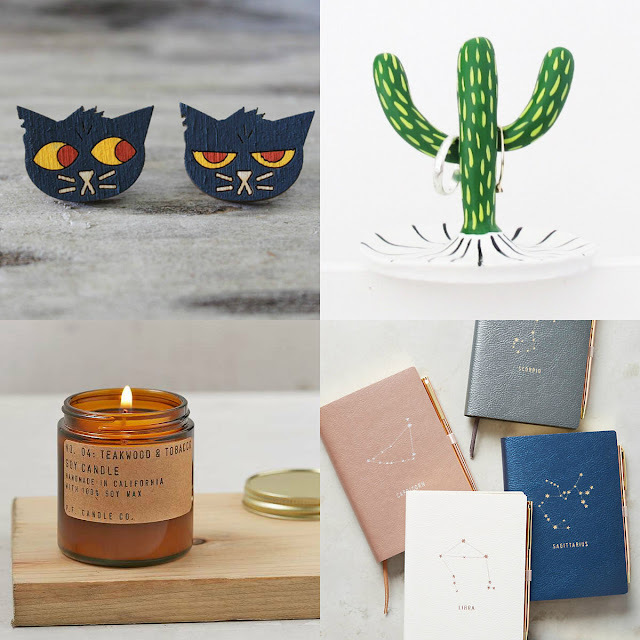 Is there someone in your life with a penchant for hipster homeware? This Oliver Bonas filament table lamp should do the trick! 3. How gorgeous are these earrings? This etsy shop is packed with the most incredible beautiful and bright leather jewellery, I'm super into this tassel necklace and this geometric necklace too! 4. I am pretty rubbish with skincare, but I have been using Kiehl's Midnight Recovery Oil for the last few months, and it is so good and makes my skin feel happy and glowy! Kiehl's have a great gift set (featuring this very product) that is packed with their favourite essential products. 1. Edinburgh designer Karen Mabon is queen of the whimsical print, and her range of silk pyjamas are no exception. I'm a big fan of the koi carp print and imagine how fancy you'd feel, sleeping in silk veg sleepwear? 2. 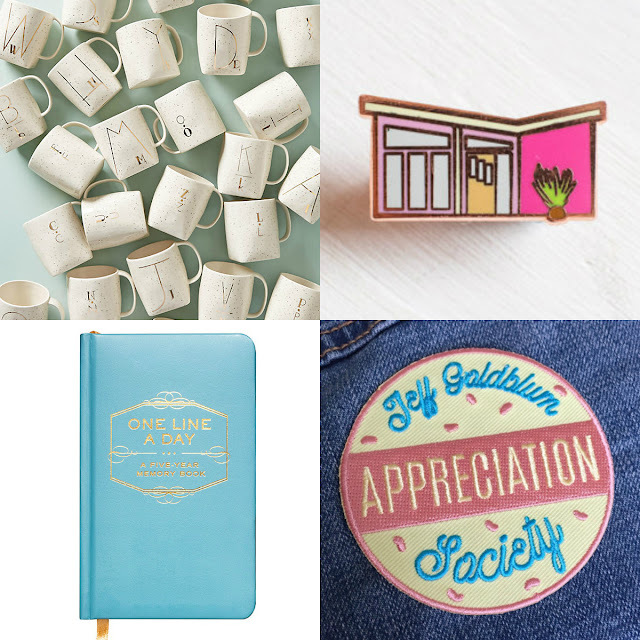 If you want a gift that keeps on giving, a monthly subscription is a great choice. Everyone should have fresh flowers in their home, and Bloom & Wild's letterbox flowers are gorgeous, and mean you never have to worry about scheduling delivery times. 3. You can't go wrong with anything from MAC's Snowball Holiday Collection, but if you really want to impress, this MAC Classics lipstick kit is the way to go! If your budget can't stretch to that, the mini kits are cute too. 4. It's got bees on it! It's vegan-friendly! You can personalise the strap! Did I say it had bees on it?! 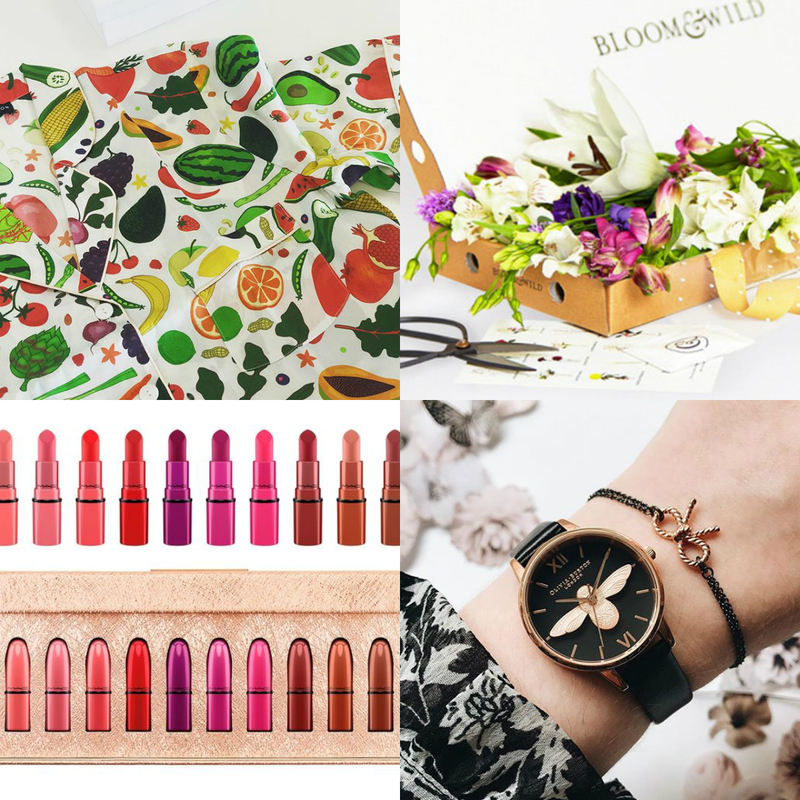 (I love bees, this Olivia Burton watch is wonderful).